Gensco sponsored internal testing has demonstrated a greater degree of drug movement across synthetic human skin (in vitro diffusion cell tests), estimated at more than 3 times that of typical topical lidocaine formulations. It is believed that this greater rate of diffusion is responsible for the faster onset of action seen with LiDORx 3% in other Gensco sponsored internal testing. 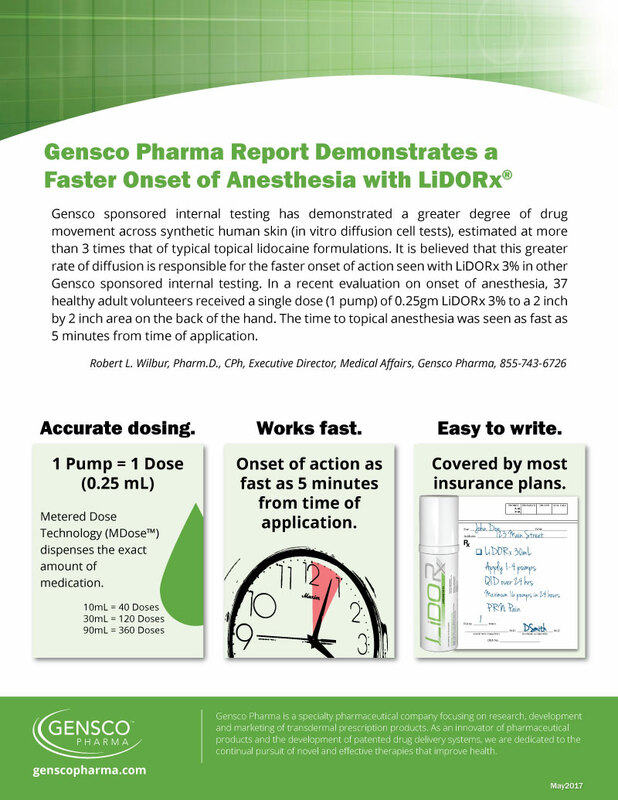 In a recent evaluation on onset of anesthesia, 37 healthy adult volunteers received a single dose (1 pump) of 0.25gm LiDORx 3% to a 2 inch by 2 inch area on the back of the hand. The time to topical anesthesia was seen as fast as 5 minutes from time of application. To read the full research report, please click here.